Cape Charles sprang into being in the late 19th century. The brainchild of two northerners, the township was intended to be the final stop on the railroad tracks leading from New York and Philadelphia. The settlement was laid out in a unique manner, with a square park serving as the center of the town upon which four main streets converged. At the outset of the 20th century, Cape Charles thrived due to the bustling railroads; however, in 1958 passenger trains quit Cape Charles entirely, and visits from freight trains slowed. Since that time, the seaside town has remained relatively unchanged, retaining much of its historic character and charm. 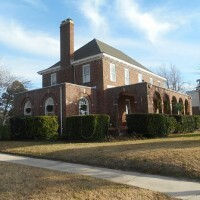 212 Bay Avenue is a brick, Colonial Revival style dwelling overlooking the bay where freight ships once ferried railroad cargo to Norfolk. The dwelling, which has a distinctive five bay front porch, has been renovated for use as a bed and breakfast. As a result of the tax credit project, the kitchen and bathrooms underwent renovations and HVAC was installed. Windows were repaired and the exterior brick walls repointed wherever deterioration was detected. Plaster throughout the dwelling was restored. The home’s original garage had been altered sometime in the past, with two manual garage doors inserted as well as a non-original pedestrian door. In order to accommodate modern cars, a new, automatic garage door was installed. Moderate landscaping was done as well, with permeable clamshell parking poured to accommodate guests.